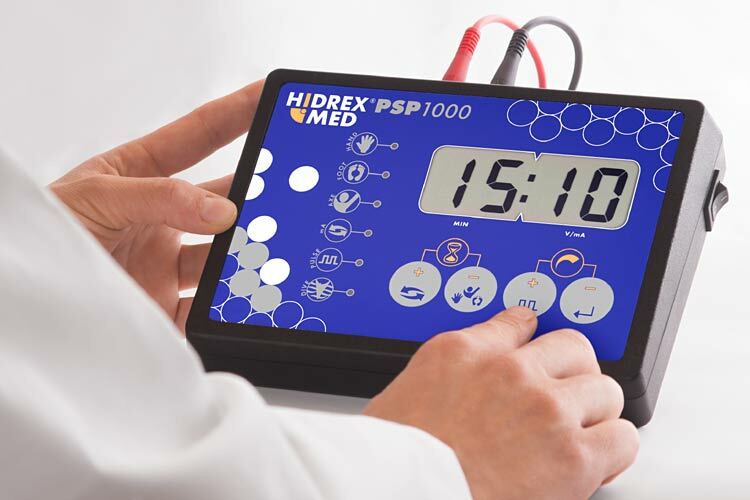 The newest iontophoresis device model from the manufacturer Hidrex, is the Hidrex PSP1000. This professional machine is the successor of the Hidrex PS500 and offers an even more individual way of therapy settings, allowing to set the device more specifically, depending on which parts have to be treated. As shown below on the first image, a pulse width of 50% equals a full pulsed current and a pulse width of 100% equals a full direct current. So, the nearer you are to the direct current the more efficient the treatment will be, but the more painful it can result. 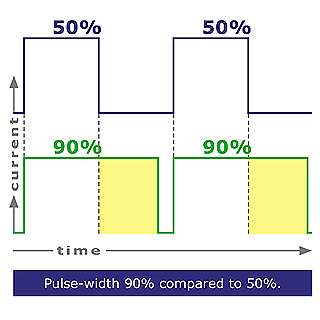 If you take a look at the second image, you´ll see the differences between a full pulsed current with a 50% pulse width and a pulsed current with 90% pulse width. 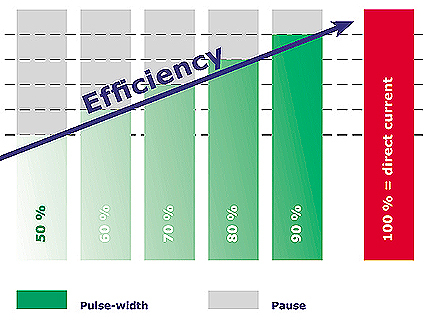 So, if you put it in easy words, the bigger the breaks in the time line, the more pulsed current you have. The smaller the breaks, the nearer you are to the full direct current mode. 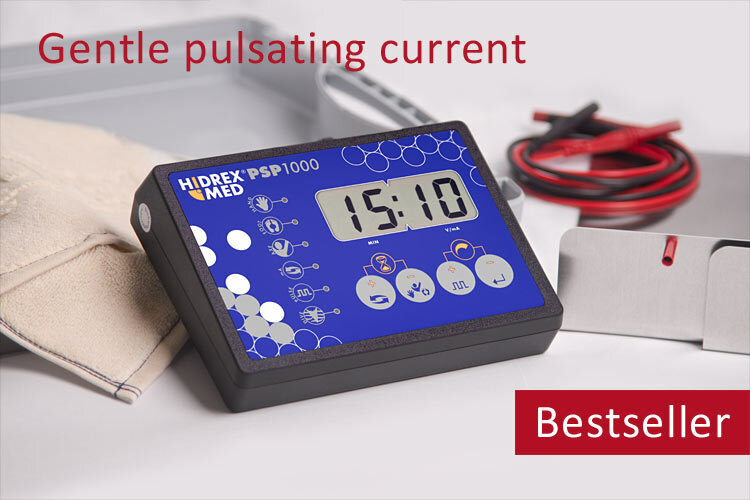 The advantge of this new device is the following: With the older model, the Hidrex PC500 you were only able to choose either between full direct current or full pulsed current mode, so basically you only had 2 types of current to choose from. 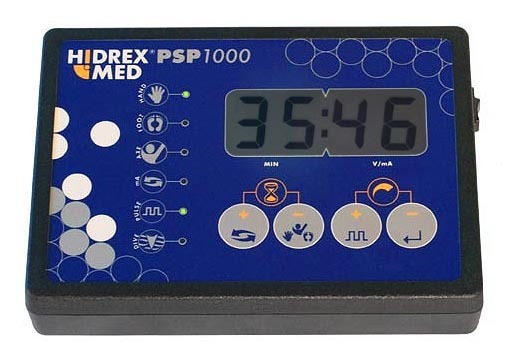 With the new Hidrex PSP1000 you have 6 different types of current to choose from. Specially when having to treat more than one area, this device is the perfect fit. Within each current type, you can still choose the strength of the current. So you see, there is actually no other device which allows such individual and focused settings, depending on the body part which has to be treated. The device is operated by mains electricity and has a stable and scratch resistant control pad. Similar type control pads and buttons are used extensively in the medical industry and can withstand the heavy use in clicnics as well for home usage, before wearing out. It has a memory function to store treatment times and current levels. The device is easy to use and the control pad feature allows treatments to be fully automated making easy and unaided use of the machine possible. Do-it-yourself home use even when only treating hands. Other models are characterized by a footswitch. This device automatically recognizes the therapy start, slowly builds up the treatment current and at the end of the treatment it will switch the current off again. Switchable Direct and Pulsed current unit for very sensitive patients (e.g. for the treatment of severe sweating in children). It is absolutely recommended for hand sweat and armpit sweat treatments. take a pulsed current machine, it is worth its money absolutely! Stainless Steel electrodes – the standard set comes with aluminium electrodes, but can be fitted with stainless steel electrodes instead. Stainless steel electrodes are easier to clean and require less frequent cleaning. They are more scratch resistant and can better resist attack from calcium. If you do not suffer from a nickel or chromium allergy we recommend the option of stainless steel electrodes. Armpit pads and electrodes - for the treatment of underarm sweating, you will need to buy in addition to the iontophoresis unit, these armpit pads with electrodes. We will not let you alone with your iontophoresis unit ! 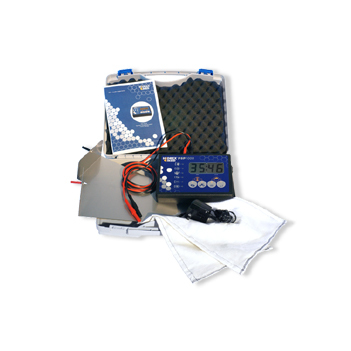 The purchase price includes also the warranty guarantee and shop features of iontophoresis-device.com shown here. Included is f.e. access to an experienced support team who can advise you in your iontophoresis treatment plan. Access to the Premium Support Iontophoresis Forum where you will find a lot of helpful information including an e-book on iontophoresis and hints, tricks and tips from iontophoresis-device.com and other successful users. 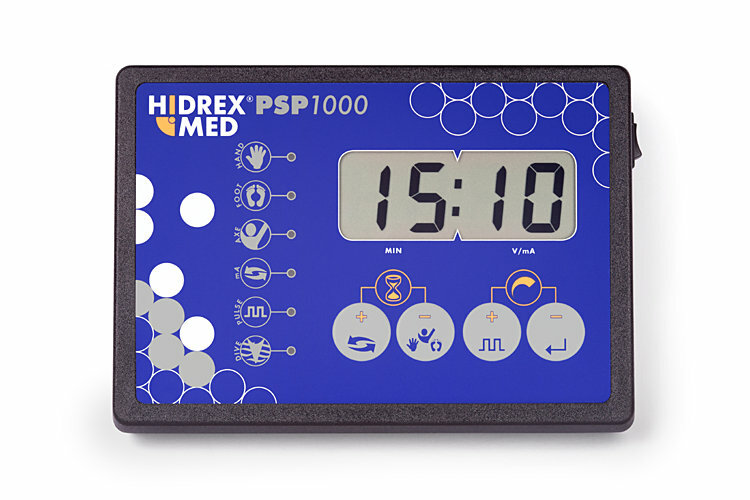 The Hidrex Pulsed iontophoresis device is one of the most powerful devices on the market. Iontophoresis devices are used for achieve dryness. This can be the answer to your problems with excessive sweat. Hidrex1000 the joy of dry palms! Our direct current iontophoresis device against sweating, stops the sweat. Suitable for armpits, sweaty feet and handsweat.